Time to chuck out your Apple set? Reviews Sennheiser launched the MM50 last year, but it's just re-issued the set, this time in white as well as black, and with a nod toward Apple's iPod Touch and new MacBook laptops as well as the iPhone, which the 'phones were originally designed for. The MM50s are an in-ear set, sliding into your ear canal on rubber sleeves intended to keep noise out and music in. Sennheiser supplies three sets of sleeves, one each of the small, medium and large sizes. 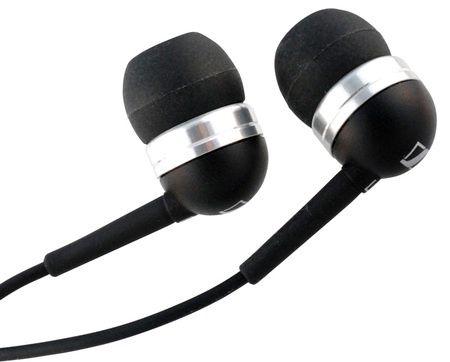 They're of the flexible type, rather than the harder kind or the sponge sort included with higher-end earphones. The rubber theme continues with the cord, which has the same feel as the sleeves rather than the smooth touch you usually get with plastic headphone cables, and with a figure-of-eight cross-section rather than a circular one. According to the Reg Hardware shatterproof ruler, the cord runs 85cm from the slim 3.5mm jack - fully compatible with the original iPhone's recessed headphone socket - to the microphone dongle. There's a further inch of cable before it splits into two: 13.5cm off to the left earpiece and 43cm to the right hand one. The split is sealed within a plastic blob. We're not fans of asymmetric earphone cabling because we find cables usually tend to hang centrally. Having a much shorter cable means the left-hand earpiece suffers all of the inevitable pull of a cable caught between layers of clothing and bag straps as you're walking around. It's worse with in-ear phones, because we always find it also makes it more likely that a cable will rub against you or your coat, the vibrations travelling along the cord to your ears, where they're seemingly amplified because the rubber sleeves are blocking out the noise that would otherwise baffle them.